Eager to get out and do something tonight? Why not try Triple Play Family Fun Center? Located just 15 minutes from Coeur d’Alene, Triple Play is a great place for all kinds of fun activities. Date night? Try bowling or mini-golf! Triple Play has both an indoor and outdoor course (However I am not sure if the outdoor course is open yet). Indoors is a 9-hole black light course with exciting twists and turns at every hole. The 9-hole course is perfect for a quick game and you can easily do two rounds within an hour and a half or two hours. Afterwards make a stop at the Garden Fresh Grill for pizza, hot dogs, burgers, appetizers and more. Triple Play is an excellent choice to get the kids out if they are feeling restless. 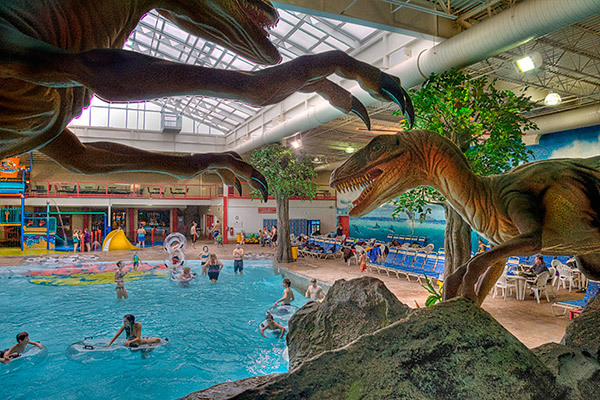 With a full sized indoor water park, hours of fun can be had. Raptor Reef is a 25,00 sq. foot facility featuring a wave pool, children’s lagoon with a two-story play structure complete with slides, water guns and a tipping bucket full of water. There is also a Jacuzzi and three huge water slides with over 1000 ft of combined slides. The water park sits at a nice 86 degrees so you won’t have to worry about being cold. The kids are sure to be tired and happy after a few hours at the water park. Get a group together and go for a round of laser tag or try your hand at the go-karts! Go karts are exciting and tons of fun. Triple Play’s outdoor track is over 860 feet long! Strap in and get ready for some serious fun! 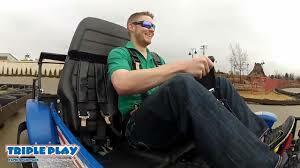 Note – the drive height for go-karts is 58″ minimum and passengers must be at least 40″ tall to ride along. Whatever your in the mood for, Triple Play will have an activity for you. Aside from what I listed here, Triple Play also has an arcade, climbing wall and more. Triple Play has also announced that they are expanding! Soon they will have an expanded laser tag arena and a three-story ropes course! I can’t wait to see what they come up with! A perfect way to spend a Wednesday night, get the whole group together and take a trip down to Triple Play Family Fun Center! To get to Triple Play, head north on US-95 for 6 miles. Triple Play will be directly off the highway on the right-hand side. If you decide to go to Triple Play tonight, comment your experience below! Happy wanderings! Cleaning Up Our New Home!